Fredericton is the capital of New Brunswick, where a mass shooting in 2014 led to the deaths of three Royal Canadian Mounted Police officers. 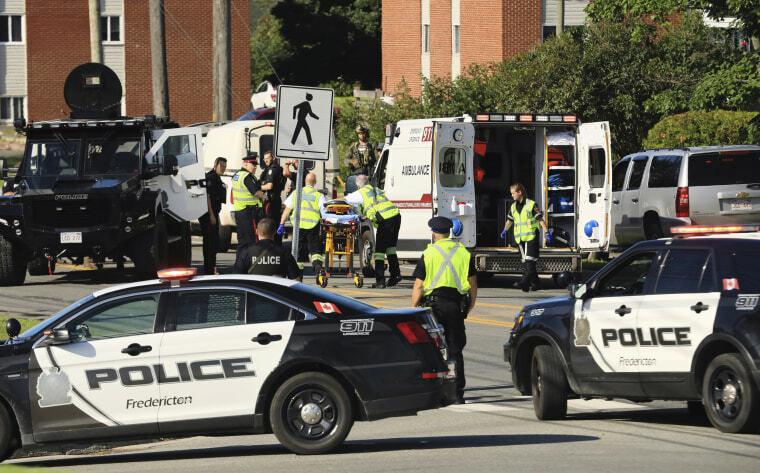 FREDERICTON, New Brunswick — Four people, including two police officers, were shot to death in an apartment complex in the eastern Canadian city of Fredericton on Friday, and a suspect was taken into custody, authorities said. It was a rare instance of gun violence in the Canadian province of New Brunswick. Fredericton police identified the slain officers as 45-year-old Lawrence Robert Costello, a law enforcement veteran with 20 years of experience, and 43-year-old Sara Mae Helen Burns, who served on the force for two years. Authorities said they could not release any information on the shooting suspect as their investigation was ongoing. He awoke in his apartment on Brookside Drive around 7 a.m. local time to the sound of three gunshots about 30 feet from his bed.